Brother South is at it again! In Everly Brothers Reminisce the guys will take you back to the early rock and roll era with memorable hits and tidbits of information about Don and Phil Everly. 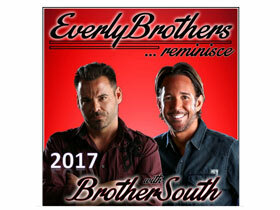 Branson duo Shane and Dave replicate the Everly harmonies, combined with an outstanding group of musicians. Enjoy songs like Bye Bye Love, Wake Up Little Susie, (Till) I Kissed You, Cathy’s Clown, All I Have To Do Is Dream, Let It Be Me, Walk Right Back and so much more! For more information on Branson shows and tickets, contact Branson Tourism Center today!